One of Dallas’s many water vistas; White Rock Lake offers many exceptional backdrops for timeless wedding photography. Begin your wedding day photo shoot at the beautiful Dallas Arboretum, located off Garland Drive on the southeastern edge of White Rock Lake. The Arboretum is a sanctuary of calm and offers a variety of floral displays. The reflecting pools and statues provide countless opportunities for both close up and distance photographs. Have your photographer arrange individual poses of the bride and groom beneath the stone arches of the DeGolyer Loggia, evoking an ambiance of history and stateliness. Bring the entire bridal party to the McCasland Sunken Garden where newly manicured lawns and stunning stonework offer an ideal stage for whole group shots. Alternate between groomsmen only and bridesmaid only poses and then arrange the entire group for the photographer to capture the backdrop of the sunken garden. For a less dramatic and more mysterious effect, move to Nancy’s Garden. The delicate canopy of trees lends an intimate ambiance to private shots of the bride and groom. Then bring your group to the cozy gazebo overlooking the Boswell Family Garden. The gazebo offers a stage for a more traditional wedding photo shoot. After a few shots of the newlyweds, bring the bridal party in for concluding group photographs. Often used for model photo shoots, the Mandalay Canal presents striking photography opportunities for your wedding day itinerary. Bring your party here at late afternoon, the best time for shooting photos as the waning day light casts stunning reflections on the adjacent skyscrapers. Take a stroll across the street and along the lake for more European-style architecture, complete with stucco and iron railings, moss and stonework. Journey next to the nearby Mustangs at Las Colinas . These award-winning sculptures adorn Williams Square in Las Colinas, and the fountains strategically arranged about their legs lend grace to the overall effect. The expansive steps and flat areas provide idyllic locations for shots of your entire bridal party. Your photographer should take care to arrange the group with the powerful statues in perspective, capturing the running water and beauty of the scene. This historic site is impressive with modern buildings in the background, while older boats on the river offer more photo possibilities. Arrange for enough time to bring your party aboard one of the boats, adding fun and flair to your group’s photo experience. The architectural diversity and cultural infusions of downtown Dallas provide endless possibilities for your tastes and wishes. For a stately effect, stop at the Adolphus Hotel and have your photographer take several group shots amidst the richly paneled lobby. Deep wood tones give a definitively old world feel reinforced by the authentic, original interior pieces. Have members of the bridal party pose on the majestic furniture for scenes of a time gone by. Move then to an updated hotel scene at the Indigo Hotel in downtown Dallas. The classic exterior and entrance, replete with blue awnings, provide a classy urban backdrop for individual poses of the couple. 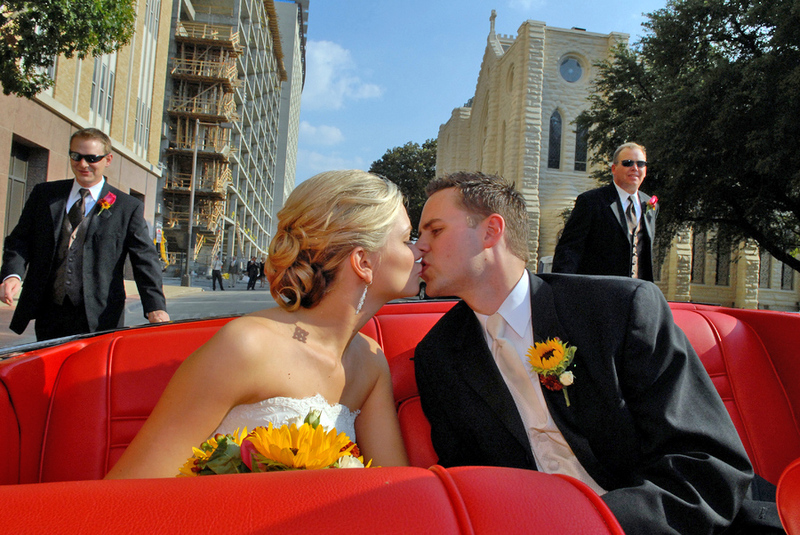 For the next stop on your wedding photo itinerary, take a limo to Fair Park in south Dallas. Rich in history, this park has its origins in the Texas Centennial Exposition. The art deco flavor blends nature with artistic innovation for your wedding photos. Art deco statues, sculptures, and museum interiors offer flavor and splashes of artistic color to lend distinctive character to your photographs. Next move on to the Hall of State. The majestic exterior is perfect for zoomed out photos. Arrange your entire bridal party on the low steps with the symmetry of the building flanking the group. Bring the party then into the lobby, a fabulous example of western themes blending in art deco style. After the Hall of State, visit the Texas Discovery Gardens, also in Fair Park. Impressive fountains and landscaping offer key locations for shots of the couple. For truly distinctive shots, journey to Deep Ellum, the vibrant haven of live music and emerging art in Dallas. Located close to downtown in east Dallas, Deep Ellum provides a unique twist to the contemporary wedding photo shoot. Those seeking a more artsy wedding photography milieu will relish in the intriguing clash of historical and modern offered by Deep Ellum. Relics of industrial architecture act as exceptional backdrops for individual shots; have your photographer arrange several poses of the newly wed couple alone. Bring the bridal party in for a few group shots, positioning all members so that they are looking toward the bride and groom. Deep Ellum also provides unique perspectives of the Dallas cityscape and larger skyscrapers, excellent for whole group pictures. The modern bride and groom will appreciate the artistic contrast between the planned beauty of their party’s attire and the creative abandon of Deep Ellum. Classic graffiti brick walls and ever-evolving spray murals offer ultra-contemporary options for unmatched wedding photography. 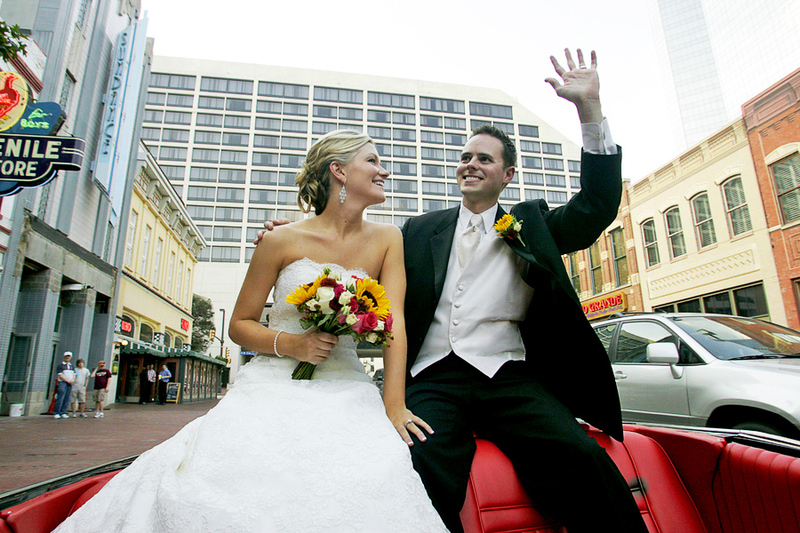 Journey beyond downtown and Dallas city limits for more wedding day photo opportunities with the distinctive metropolitan ambiance. Clark Gardens Botanical Park is your first destination. Pause first at Channel Gardens for a beautiful bridal party shot at the foot of the pool and fountain. The symmetry of this garden will give your photography a sense of calm and balance, not to mention exquisite taste. Continue to the idyllic chapel and pose for bride and groom photos on the grassy green fronting the peaceful building. The Lake Pavilion offers stunning water views for whole group photography. 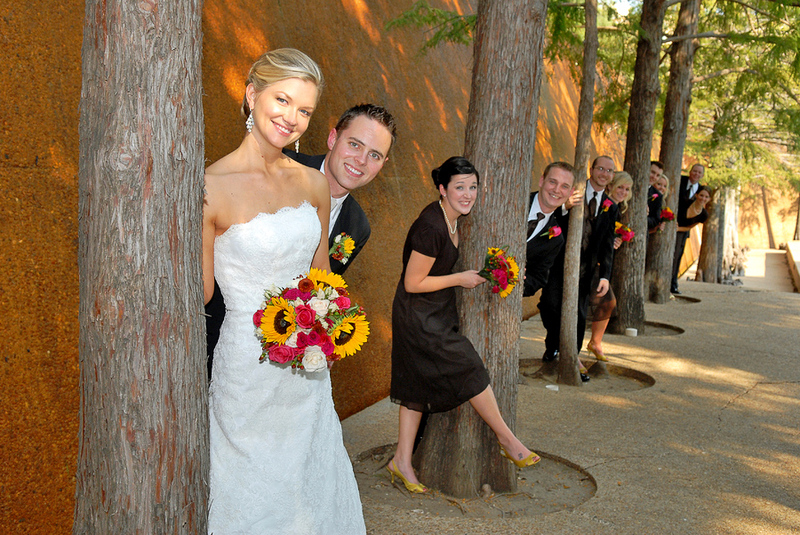 Clark Gardens offers countless options for many stops along your wedding day photo itinerary. If the Fort Worth area is more fitting to your plans, the Fort Worth Botanic Gardens are the perfect spot for your wedding day photos. Your first stop will be the Lower Rose Garden, a gorgeous location marked by old European elegance. Inspired by the gardens of an Italian villa, this garden boasts thousands of rose blossoms that provide tremendous color for group and couple shots. Move then to the gazebo in the Oval Rose Garden, ideal for a solitary pose for the newlywed couple. For an exotic touch, visit the Japanese Garden and have your photographer arrange a group pose atop the classic arched Japanese bridge, and conclude with an individual shot of the bride and groom. For a decidedly western flair, bring your group to historic Grapevine, an expanding town with many recent improvements to enhance its character. The old train station on Main Street is perfect for your wedding day photo shoot as the old rail cars give rich color for backdrops. Couples seeking a western ambiance will be more than pleased. After several shots of the newlyweds, cross the street to the workshop where they maintain the old steam locomotives. Bring your bridal party into one of the locomotives just to the left of the Grapevine Vintage Railroad cars. Have your photographer arrange a few fun-inspired photographs in the locomotive before moving on. If desired, you can board and ride it from Grapevine to the Fort Worth Stockyards for even more of a western feel!